David Krut Projects is delighted to be hosting “Cumulus” a launch of new works Robyn Penn’s following her latest collaboration with the David Krut Workshop (DKW) . The launch takes place at David Krut Bookstore at 151 Jan Smuts Avenue, Parkwood from 6pm to 9pm, Thursday, 5th November 2015, at 151 Jan Smuts Ave, Parkwood, Johannesburg. 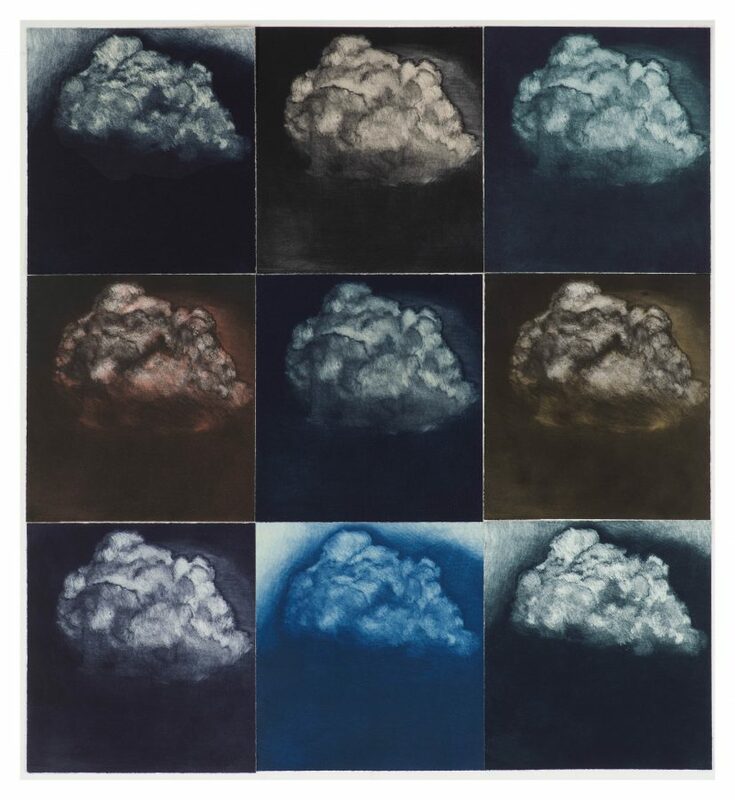 Here the monochromatic colour variations that define the series of complex mezzotints titled, Nine Views of a Cloud, gives way to multicoloured dry point aquatints totaling four colour variations depicting a single cumulus cloud printed from a set of three plates. For the first time both series can be viewed together. The cloud stands as a motif to suggest our inability to comprehend our place in the cosmos. This is the lot of the human condition: a universal anxiety which expresses itself in an endless quest for understanding and meaning. Historically we can trace the antecedents for the cloud archetype that pervades human consciousness, figuring in religions and theological writings, from pre-Christian creation myths to the writings of the Christian philosophers, Gallus, St. Augustine, Thomas Aquinas, and St. Denis, and also featuring prominently within Jewish Cabbalistic texts, as well as Buddhism, Hinduism and Taoism. It finds resonance today in religious skepticism and the preference for scientifically- based cosmological searches for understanding, the only reliable conduit for this search lying in pure mathematics and then only through hypothesis. Ultimately, religion and mysticism are the metaphorical and atavistic aspects of the flip side of that coin. For the purpose of understanding the philosophical underpinning of this archetype it’s worth noting that Cloud of Unknowing derives its name from a contemplative and anonymous late fourteenth century text, the central theme of which deals with the ineffable and ultimately unknowable nature of the divine, the profound mystery of a creator forever eluding our understanding, a negation of the intellect in favour of a surrender to the senses in order to achieve transcendence or mystical ascent, a cloud that simultaneously reveals and conceals the metaphor of divine presence. In Robyn Penn’s earlier paintings and prints, a paradox is posed between the destructive power of the mushroom cloud of war and the generative power of the cumulus cloud expectant with life-giving rain. In this metamorphosis, however, were one to adhere to the original medieval context of Augustine, then the world can only be apprehended through mystical experience and vice versa. It is a state beyond classification and nomenclature. Thus, Robyn Penn’s, Cloud of Unknowing, though it is conceived in our emphatically secular age, in a Jungian sense, hints at an age-old ontological/teleological conundrum. Penn finds more overt affinity, however, with artists of the Romantic era, especially those of the German school like Casper David Friedrich who represent in their painting the solitary individual’s encounter with the sublime, intertwining their yearning for spirituality with the awe-inspiring majesty of Nature. 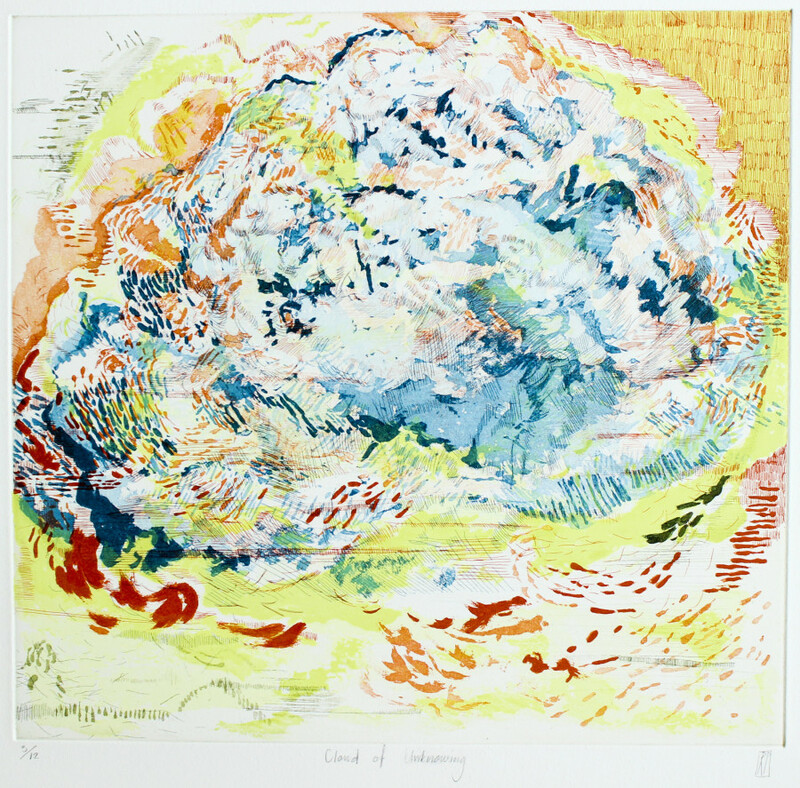 What matters for Penn is the phenomenological aspect of clouds with their mutable qualities of “transformation and dissolution”, intangibility and sublimity which finds formal expression in the manipulation of the printmaking medium itself, in other words, the process of repeatedly modifying a single image by enacting colour changes as the series builds, organizing the sequence of prints as one would read colour progression on a colour wheel. In doing so, Penn also references the Japanese printmaking practice of ukiyo-e in which the printmaker compulsively reiterates the same image. To follow its logical trajectory Cloud of Unknowing metaphorizes the latency of fission chain reaction before activation and its unpredictability once energy gets liberated: from fission through to fusion – the thermonuclear kind, a super-enhanced modern incarnation, lighter in tonnage, but packing hundreds of times more nuclear energy which smashes all matter into sub-atomic particles and massless particles of radiation, in other words, dissolution as endgame to fit the nihilistic age in which we live.